I just finished a new painting today. It's a new style for me. This little lovebird is something I've been working on for a while. I've always been really inspired by Indian art and I recently watched a Basquiat documentary, so I decided to just go wild with this one. Savoring last days of Summer. I've been painting outside, so I can get really messy. Then, I added COLOR all over it. And finally, I filled the canvas with graffiti and Indian inspired designs. And here's the finished painting! 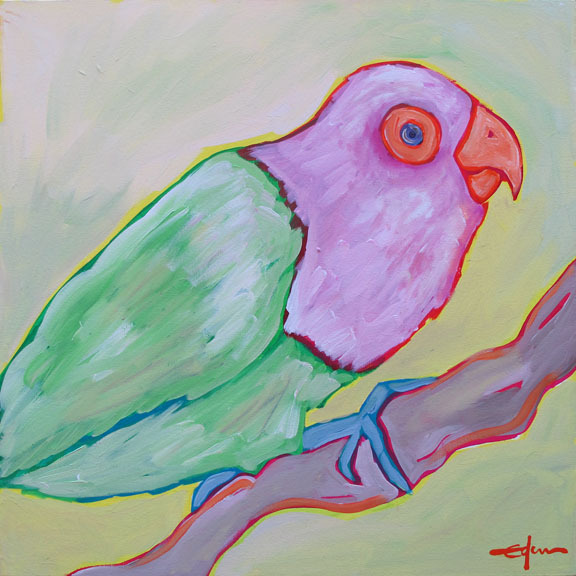 "LoveBird", 24x24 acrylic on canvas. A cherry little bird in a splendiferous summer garden. It's in my etsy shop now! I LOVE THIS!! Are you selling it? (not like "I" have any money...) Just wondered. It's beautifuL!! Yes, I'm selling it. It's in my etsy store right now. Thanks!!! still love it and wish I had $$ for it!